Special Containment Procedures: SCP-1182 is essentially harmless and as such is to be contained in a standard locker. Because of the object’s unique mental effects, usage of it is not permitted unless at least one Level 2/1182 clearance staff member is present. 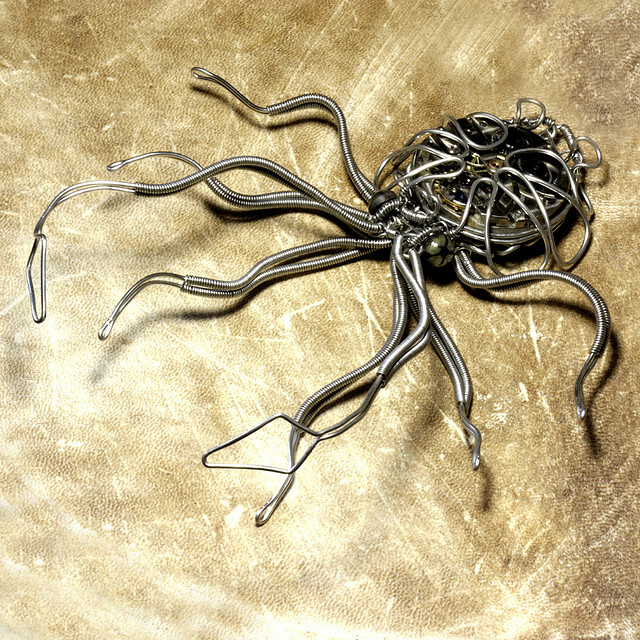 Description: SCP-1182 is a small octopus sculpture approximately 171 mm in length and 76 mm in breadth, weighing 312 grams. It is constructed from a combination of wire, copper, and titanium alloy. The head of the octopus contains a clockwork contraption that serves no documented purpose. When held by a subject (who will henceforth be referred to as SCP-1182-1), SCP-1182 and SCP-1182-1 become effectively invisible. SCP-1182 causes the subject to camouflage perfectly with their surroundings. The sculpture causes an as of yet unexplained reaction on SCP-1182-1’s pigmentation, giving it the properties of an octopus in disguise. This also means that the subject can only achieve full invisibility while naked, as the effect does not extend to clothing. The camouflage is distinctly much better than that of a common octopus, as SCP-1182-1 blends in to the point where it is impossible to distinguish their position. If SCP-1182 is released, the subject appears to “blink” back into existence. Of note is the mental effect that the octopus has on SCP-1182-1. While holding SCP-1182, the subject perceives the room as if it were filled completely with water. The presence of sea life from fish to coral to sea vegetation has been reported in all cases. Other personnel in the room are seen behaving as if submerged. Conversation with SCP-1182-1 is impossible as the subject hears only gurgling noises as if the speaker were communicating underwater. When SCP-1182-1 moves, they feel as though they are swimming. In three cases, SCP-1182-1 reported seeing their limbs as the tentacles of an octopus. SCP-1182’s effects, both the camouflage and the hallucinations, only work if the octopus is in contact with a subject’s skin. Tests involving holding the object through a glove and similar materials have yielded no results.